- folders not containing "/fr/" or "/en/"
I tried to put filter on file name and paths but it doesn't work. Can you please help me? Doable with regular expressions. 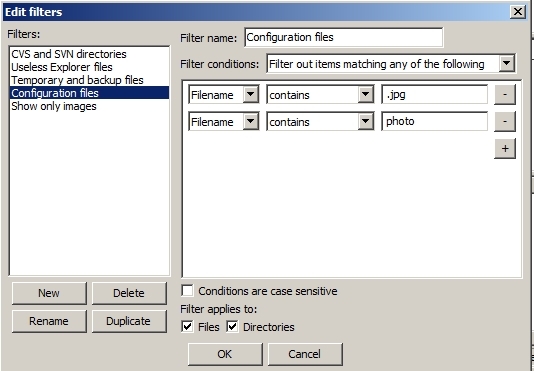 Alternatively 4 filters, one for each combination of filename and path. When downloading I want to exclude all .jpg files and all files starting with "photo" as in "photo0000001.php"
I have tried using two different filters but they do not work. 1. Use the version with two separate filters. You can restrict them to applying only to filenames, else directories would be filtered also. 2. Use "Filename begins with" and "Filename ends with", respectively, to get greater filter accuracy. 3. The filter condition must be "Filter out items matching any of the following. The one selected in your screens filters only items matching all, that means containing "photo" AND ".jpg". 4. Make sure the filter is not only defined, but also checked. The filter feature itself must be enabled, too. 5. Next time, please attach your images directly. The above works for what I need to do. >1. Use the version with two separate filters. You can restrict them to applying only to filenames, else directories would be filtered also. >2. Use "Filename begins with" and "Filename ends with", respectively, to get greater filter accuracy. >3. The filter condition must be "Filter out items matching any of the following. The one selected in your screens filters only items matching all, that means containing "photo" AND ".jpg". >4. Make sure the filter is not only defined, but also checked. The filter feature itself must be enabled, too. >5. Next time, please attach your images directly.